Castle Hill, at the westernmost point of Newport, was the site of a watchtower built in 1740. It was an obvious site for a light and fog signal to aid mariners heading to Newport Harbor and up Narragansett Bay's East Passage toward Providence. Applications have been made at various times in the past, and renewed this year, for a light-house and fog signal on Castle Hill, to guide vessels, especially in thick and foggy weather, into Newport Harbor and Narragansett Bay. After a careful examination of the locality, and a full consideration of the whole subject, it is recommended that an efficient fog signal be authorized for this point. Congress appropriated $10,000 for a fog signal at Castle Hill on March 3, 1875. 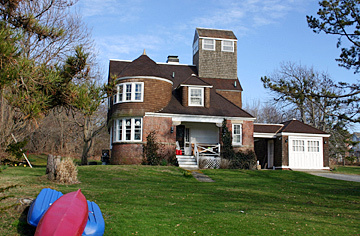 Just a short time before the appropriation, a large summer home was built on the property that was coveted by the Lighthouse Board. The owner was biologist and industrialist Alexander Emanuel Agassiz. Agassiz had made a large fortune as the president of a mining company. Agassiz established a marine laboratory on the site that operated until his death in 1910. Agassiz refused to sell, and the $10,000 was allowed to "lapse back to the Treasury." A buoy with an automatic whistle was proposed for the area near Castle Hill, but the idea was discarded because of the sheltered nature of the location. The proposal for a fog signal at Castle Hill was revived in 1886, and another $10,000 was appropriated. This time the plans were to include a lighthouse, provided a suitable site could be obtained "without expense to the Government." Agassiz relented and gave a suitable portion of his property to the government for $1 on June 10, 1887. Contractor William T. Wilbur of Newport was hired to build the station. Water access to the rocky site was problematic, and Wilbur was guaranteed he would be allowed right-of-way across Agassiz's property. Agassiz objected. 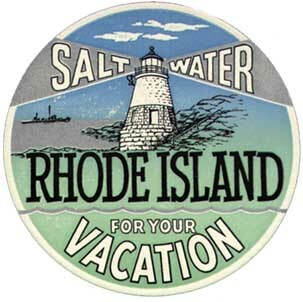 He wrote on May 22, 1888, to the Third Light House District, "What with one thing and another I stand an excellent show of having my place ruined and nobody to foot the bill." In November 1888, the engineer of the Third Light House District was directed to confer with Agassiz. In the case that Agassiz continued to refuse to agree to more acceptable terms, the government would take the necessary steps "to obtain title by proceedings in condemnation." Agassiz apparently "saw the light," or realized that he would, in the long run, lose his battle with the government. On May 20, 1889, he deeded 1.98 acres to the United States "without condition and without expense to the Government." Meanwhile, an additional $5,000 was appropriated, as it was realized that the 1886 funding was insufficient to build the station. Architect H. H. Richardson made an early drawing for the proposed station. 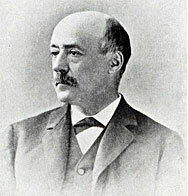 Richardson was the designer of such acclaimed buildings as Boston's Trinity Church and the Buffalo State Hospital in New York. His favored style became so popular that it was dubbed "Richardson Romanesque" after its originator. The style is characterized by rough-hewn masonry and rich details and textures, and those elements are evident in the drawing for the lighthouse. The 34-foot tall granite lighthouse was first lighted in May 1890, with a fifth order Fresnel lens exhibiting a flashing red light visible for 10 nautical miles. The keeper's house was a short walk away at Castle Hill Cove. The first keeper was Frank Ward Parmele. Frank W. Parmele. Courtesy of Cinda Parmelee. Parmele was from Guilford, Connecticut, and had served as a keeper on Faulkner's Island near Guilford, as well as at Saybrook Breakwater Light. He was a descendant of John Parmele, one of the original founders of Guilford, who arrived there from England in 1639. Parmele and his wife, Lillian (Norton), had three children. The station had a fog bell, but it had been in operation for only 17 months when it was discontinued at Agassiz's request. Five years later a larger, louder bell was installed and Agassiz again complained; this time a screen was set up to soften the sound. The tower was originally all gray; the upper half was painted white in 1899. During the hurricane of September 21, 1938, which did tremendous damage in Newport, the waters from Castle Hill Cove and the beach nearby met, turning the point into an island. Agassiz's daughter-in-law was in the cottage at the time, and was so traumatized by the storm that she vowed to never spend time there again. Soon after the hurricane, operation of the lighthouse was taken over by Coast Guard personnel from the new Station Castle Hill, a short distance to the northeast. 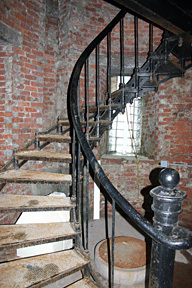 For some years, the keeper's house served as the residence of the officer in charge of the station. The Agassiz cottage was sold to J. T. O'Connell, who had established a chandlery on Newport's Long Wharf. O'Connell eventually transformed the property into an inn and added several smaller guesthouses. O'Connell died in 1974, but the property is still maintained as the Castle Hill Inn and Resort. In 1957, the light was automated and the fifth-order lens was replaced by a modern optic. Castle Hill received wide attention in June 1989, when the Greek tanker World Prodigy ran aground on Brenton Reef to the south, spilling about 290,000 gallons of fuel oil. Station Castle Hill became the command center for the Coast Guard's response. On February 10, 2005, a near disaster occurred even closer, when a 350-foot freighter was caught on the rocks near the lighthouse. In spite of a gash in the vessel's side, there were no fuel leaks and none of the crew was injured. 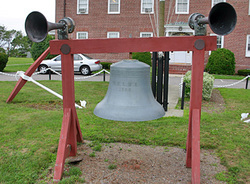 Left: A fog bell from the lighthouse is on display on front of U.S. Coast Guard Station Castle Hill. A short walk through the woods from the parking area at the marina near the Castle Hill Inn and Resort will get you to the lighthouse. The handsome stone lighthouse and panoramic view are worth going out of your way for. Right: The former keeper's house in April 2005. 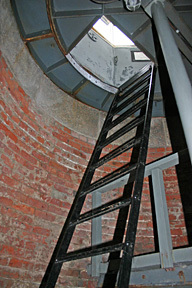 Above and right: Some renovation of the lighthouse was completed in 2012. Photos by Arthur Richmond.